Probably there is no other country in Europe burdened with an equally false and negative stereotype. 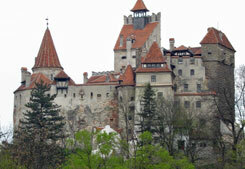 Romania is usually associated with mountain shepherds, wild nature and blood-thirsty Count Dracula. Since we started going to Romania, we have been amazed by how rich culture, landscapes and exotic atmosphere this still undiscovered country offers its visitors. We are constantly exploring cultural variety of Romania. This country is like a colourful rug with threads woven by the Dacians, the Romanians, the Vlachs, the Hungarians, the Germans, the Slavic peoples, the Gypsies, the Turks. In contrast to a stereotype, we often go to Romania and are always welcome with hospitability so that we can come back safe and sound with lots of new experiences. We can give you a guarantee for Romania.